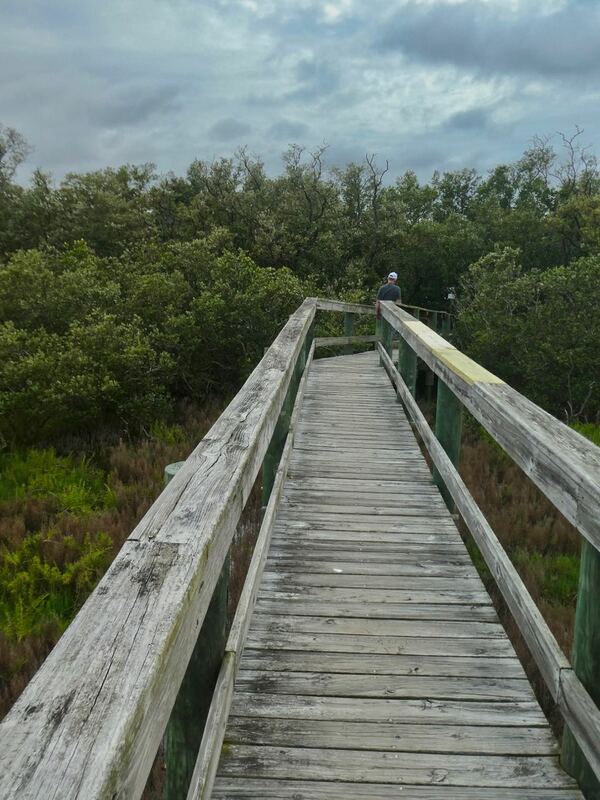 The road untraveled called.... we were Vero Beach bound to catch up with friends, and Pelican Island National Wildlife Refuge was a top rated hike in the area, awarded a Trip Advisor Certificate of Excellence. 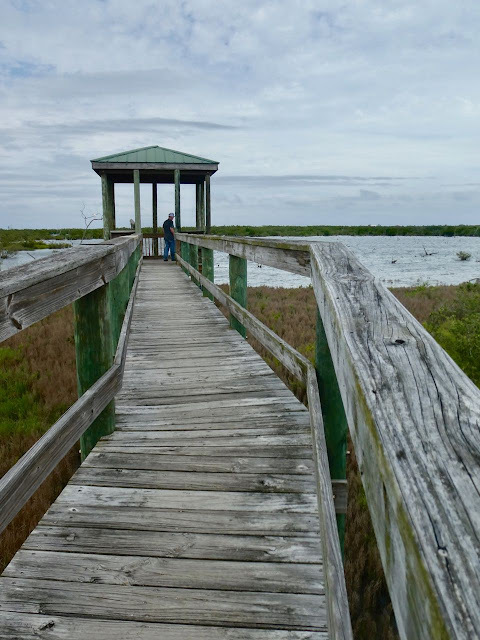 Also intriguing, Pelican Island National Wildlife Refuge was the very first National Wildlife Refuge, thanks to Theodore Roosevelt 116 years prior, as a place to protect egrets and other fancy feathered birds from plumage hunters. 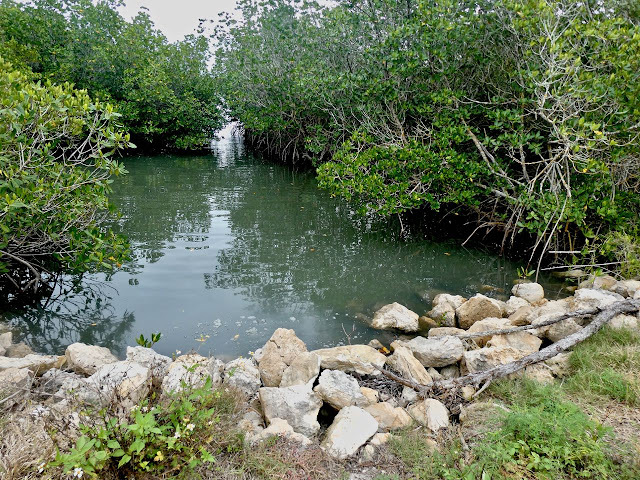 The island trail mostly parallels mangroves, which you can sometimes peer though, though mostly their dense growth blocks as well as preserves the views of a thriving ecosystem. 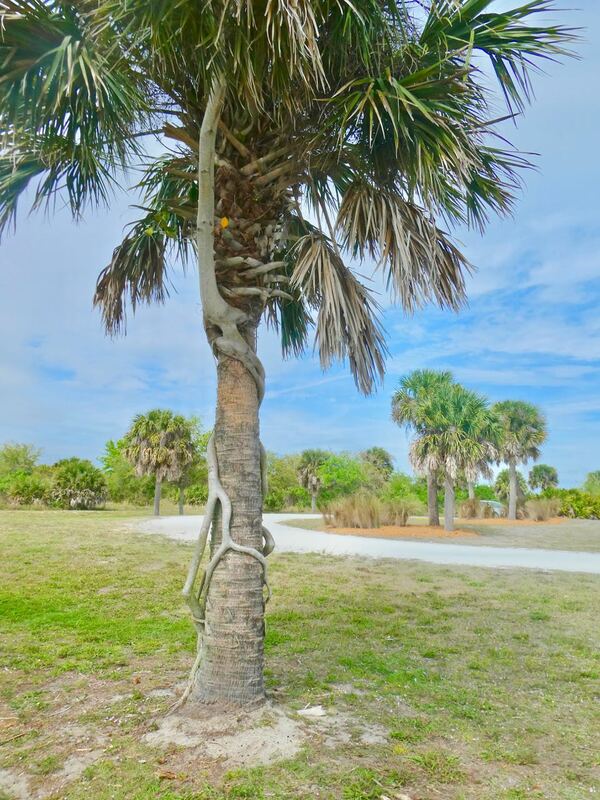 This section of Pelican Island trail gave a good view of the mangrove and the Indian River Lagoon beyond it. The orange leaves stand in bright contrast to a near monochromatically green landscape. The trails are more roads, broad and straight with some very gentle curves. Enthusiastic visitors reported seeing pelicans and a rich array of other bird life and even otters were sighted. We, however, we not so lucky. A welcome sunny array of flowers on a mostly gray day. Boardwalk to Joe's Overlook, Pelican Island. Problem is, Maritime Hammock, which we bypassed to check out Pelican Island spoiled us. Lush fern arches. 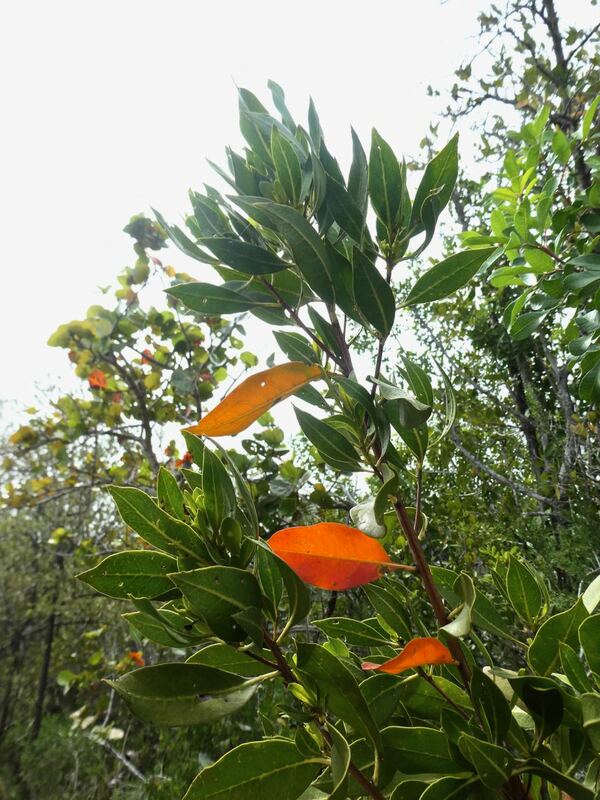 Mangroves. Marshes. Alligators. Indian River Lagoon views. Meandering trails. All that and a bobcat less than 50 feet from us and a pair of tortoises loving it up in their burrow. 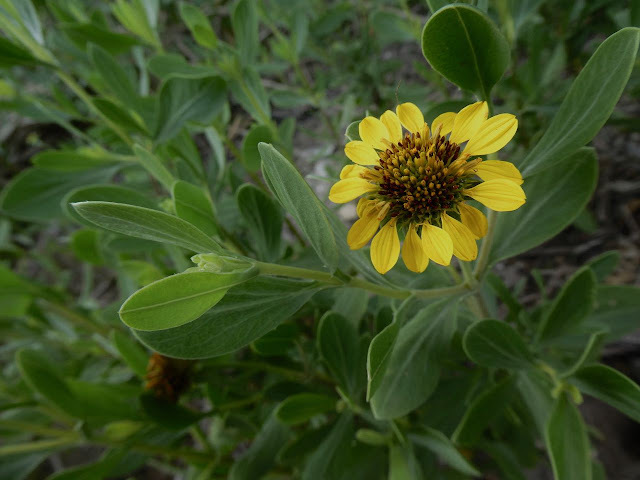 Lucky timing and the general flora and fauna at Maritime Hammock set a high bar to beat. Comparatively, Pelican Island was a little disappointing for us. View from Joe's Overlook, Pelican Island National Wildlife Refuge. Granted, we recognize some of what makes one page magical and anther a bit, well, meh, is luck-of-the-draw timing. We spent a sunny afternoon at Maritime Hammock and it exceeded our wildest expectations. 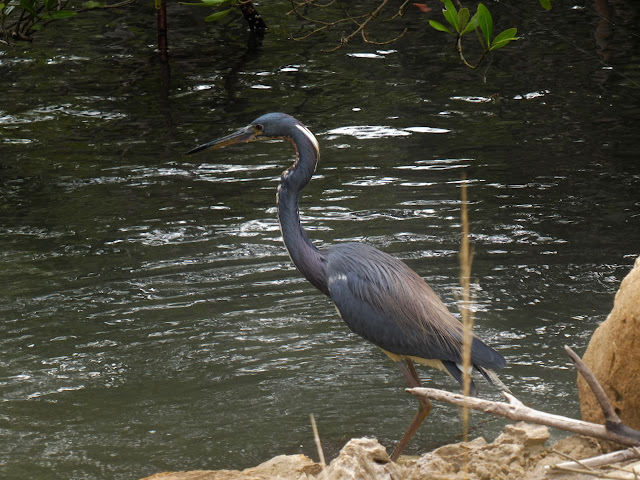 Placid blue heron at Pelican Island. Notice the white tuft below the head on the neck? We visited Pelican Island on a gray afternoon but with higher expectations. The day we visited the light was flat, though we were grateful we didn't get rained on. We saw a few cars, but passed no one on the trail. In the quiet, we heard glimmers on animals we did not see. We passed surprisingly serene herons who watched us pass without taking flight, and even spared us the usual grumpy heron croak. Cicadas serenaded us; their sound conjures up fond memories from our early Caribbean cruising days. 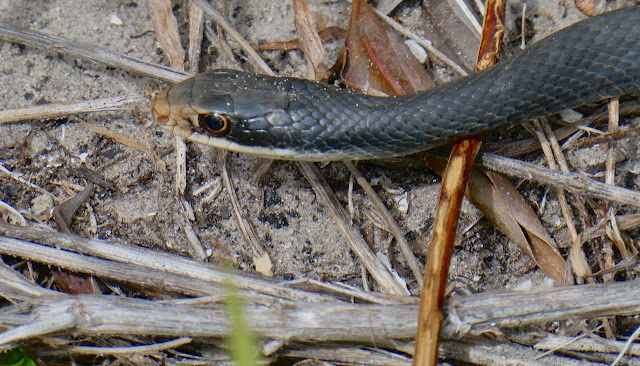 One of several of the same type snake we saw together at Pelican Island. Closer view of the snake (via zoom lens), which was happy to hang back and did not threaten us at all. Our hike's highlight was seeing seven slender small snakes all in one spot. Mating season, perhaps? Noticed these vibrant scarlet-magenta flowers were also prolific along Highway 1. 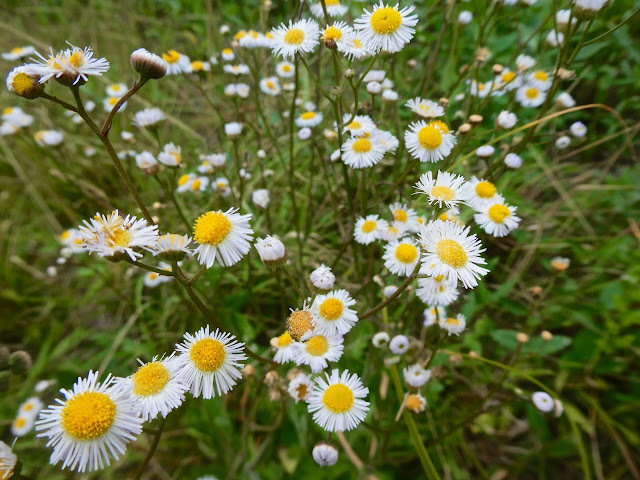 While there wasn't a great variety of trees and shrubs compared to other places we've hiked, we did see some unusual flowers, a fair amount of butterflies and dragonflies large and small. 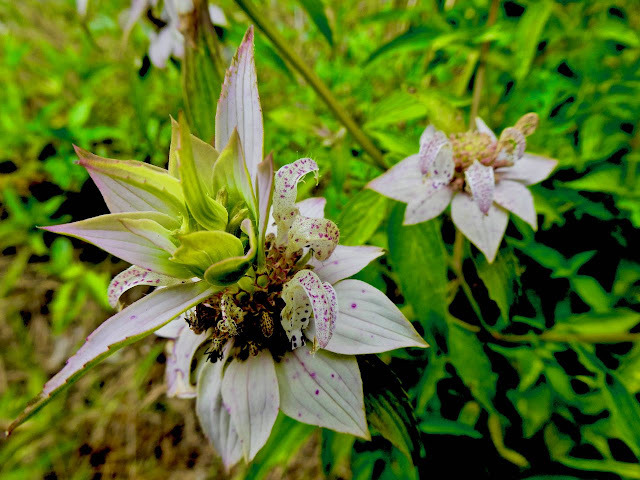 These look like bee balm or monarda; grew similar flowers in my garden in the Pacific Northwest. 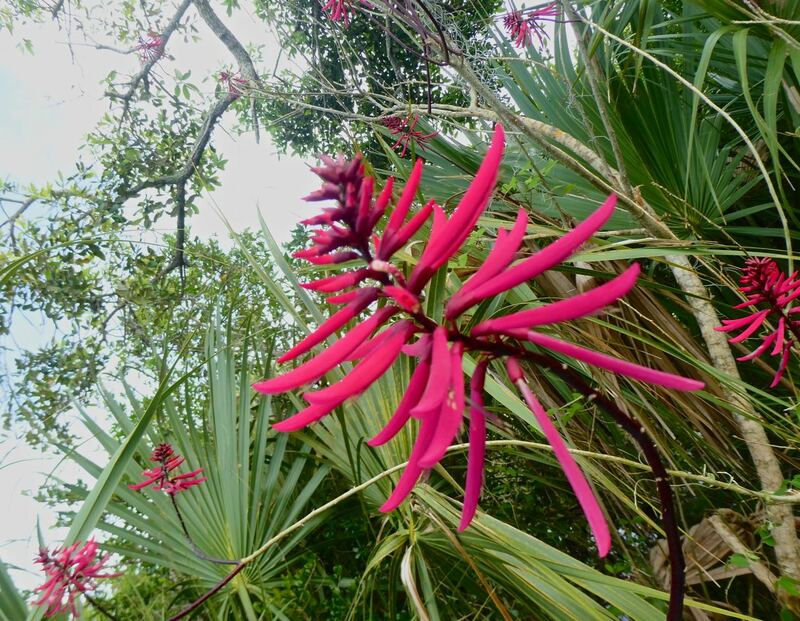 Next time we head toward Vero seeking to stretch our legs seeking new sights, we'll likely opt for two smaller spots, Round Island Beach Park, South of Pelican Island North of Vero, and perhaps opening our wallets* to visit the highly rated McKee Botanical Gardens in Vero Beach. *$12/person in the high season, $10/person in the low season. What will happen when this strangler fig succeeds in chocking out this palm? 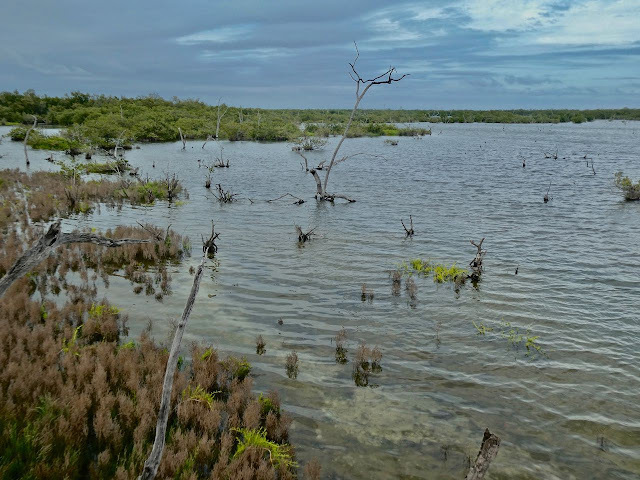 We are grateful that Pelican Island exists, protecting the Indian River Lagoon, and paving the way for other protected areas in the region and across the country. And we appreciated our leisurely, 3-mile, hour and a half walk there, even if we didn't get all that lucky on the wildlife lottery. 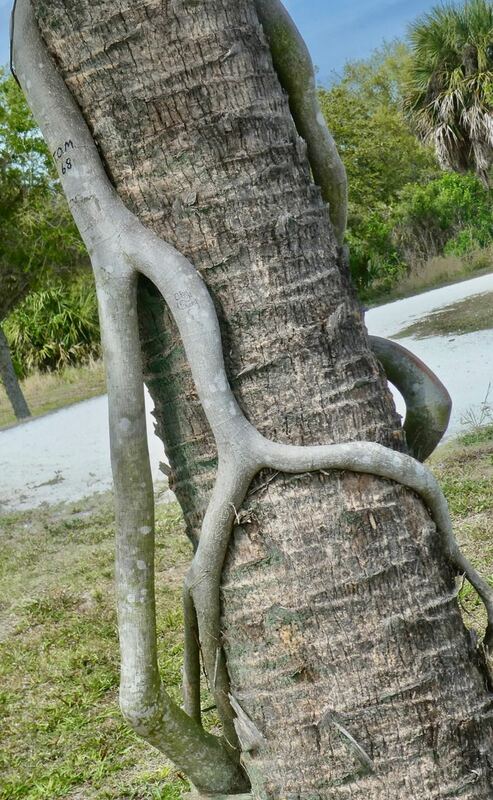 Closer view of the fig's unhealthy embrace. And the most welcome sight of all was our inspiration for the trip in the first place - seeing our cruising buddies, Ron and Dee, who we hadn't seen for five years. We got to know each other in Jacksonville Florida's Ortega Landing, and had the pleasure of cruising together in the Bahamas. They're still cruising (and were passing "our way" for new sails from Mack Sails of Stuart Florida), with no near-term plans to stop. 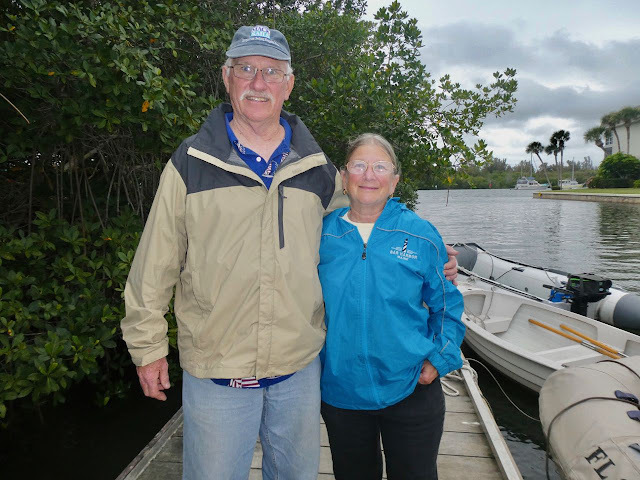 Inspiring cruisers and all-around nice folks, Ron and Dee Claus... at Vero Municipal Marina dinghy dock. We look forward to seeing where we'll meet again!